Last night at the VMAs, Kanye West debuted his new music video for “Fade” (which you’ll know if you’ve listened to The Life of Pablo). 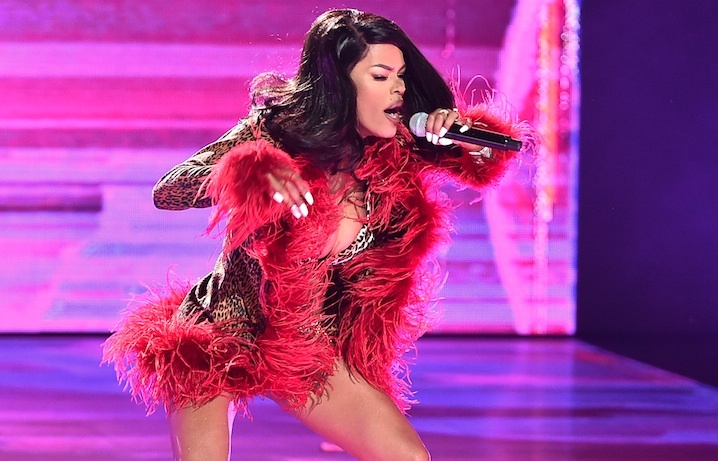 The star of the video is an incredible singer and dancer named Teyana Taylor, and is seriously poised to become a worldwide sensation. Here’s a little history: Taylor has been performing since she was a child, and actually signed to Pharrel’s Star Track Entertainment as a teen. Later she moved to Kanye’s label G.O.O.D. music, and even worked on his My Beautiful Dark Twisted Fantasy album. She released her first studio album VII in 2014, and it skyrocketed to #1 on the Billboard charts. Apparently Taylor is such a great dancer that Queen Bey herself reached out to her for a quickie tutorial on some moves! They then collaborated on Bey’s music video for “Ring the Alarm,” where Taylor served as choreographer. Taylor has also worked with Usher, Jay Z, and Nicki Minaj. Hmmm NO BIGGIE. She’s a family lady, currently engaged to this incredibly tall dude. That’s NBA star Iman Shumpert, with their daughter Junie (who was delivered by Iman in their home after Taylor went into labor early). Awwww! Rihanna then posted this video of her male hairdresser singing the same song (and picking up where Taylor left off), and wearing a wig to resemble Taylor. Here’s to hoping that’s all behind them now, because this gal is pretty awesome. Just look at this effortless style (as if we needed more reasons to get behind her). More videos featuring the incredibly talented Teyana Taylor, please!